NEW! Microsoft® Excel 2010 eBook! With NEW Costing Sheet Lesson! Easily learn the features used most commonly in the fashion industry with easy to follow, step-by-step lessons. In this fast-paced apparel industry, knowing how to use Microsoft® Excel is a must for fashion designers and technical designers alike. With the tutorials in our “My Practical Skills: Microsoft Excel for the Fashion Industry” e-book, you will learn everything you need to know to create essential fashion industry worksheets such as spec sheets, grade sheets, fashion line sheets, garment costing sheets & garment production sheets. Knowing how to use Microsoft Excel is an important skill for any fashion career since it is used in all phases: from design, to production, and even in sales. Apparel designers use Excel to create spec sheets for initial sample requests, technical designers create Excel tech packs and size grades for garment production, and sales teams use fashion line sheets created in Excel to present the current line to apparel buyers. So if you don’t know how to use Microsoft Excel or if your knowledge is limited to just entering data, it’s time to update your skills with our eBook tutorials. Unfortunately, too many fashion designers don’t know how to use Microsoft Excel to create these important spreadsheets. Most apparel designers just know the basics like how to enter data, resize cells, and change font sizes & colors. As a result, numerous fashion companies are still using outdated means such as filling out tech packs by hand, calculating size grades manually, or using an inadequate program like Adobe Illustrator to produce these fashion spreadsheets! Our Microsoft Excel eBook tutorials focus on the features used most commonly in the fashion industry, making it easy for you to learn Microsoft Excel. We’ve weeded out the unnecessary, overwhelming features of Excel that you’ll never use, to give you the practical skills needed to easily complete apparel industry projects. Hi Svetlina, 1. Since we are a US company based in NY Garment Industry, our Excel ebook works with inches. However we can provide instructions for converting specs and grading formulas to cm. 2. 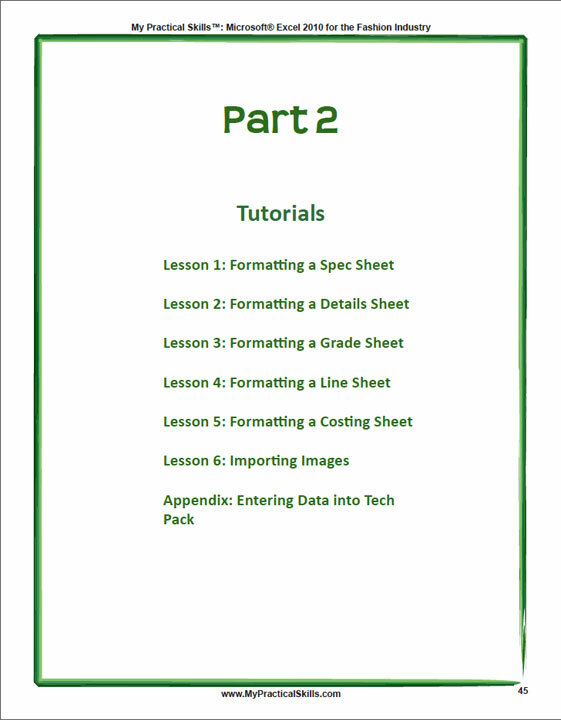 There is a lesson in this ebook that shows exactly how to format and formulate a costing sheet (you can see a preview image of the costing sheet created in the Previews section of the product page). 1. We are from Bulgaria and we are working with centimetres. Is “Excel for fashion indutry” working with centimetres too? 2. Does it give detailed technical succession for calculation of each operation for making of basic, overcoated garments, i.e. for cost price of the goods. I have Excel for Mac 2011. Will this work? I’m Merchandiser . very helpful us. have you MS xl 2007..??? Can you tell me specifically if there are templates that come with the ebook that I can drag and drop/insert my files of drawings into the excel file? Are they full and complete tech pack templates containing POM, BOM, a Construction section and any other industry Full tech pack requirements? Thanks! 1. This ebook teaches you how to use Excel to enter grade rules via formulas- it does not show you how to give fit corrections. However, if you already know how to give fit corrections, you can use the skills learned in this ebook to give corrections (there iare already columns dedicated to fit corrections and comments on the Spec Sheet of the Tech Pack and you can add additional columns as needed). 2. 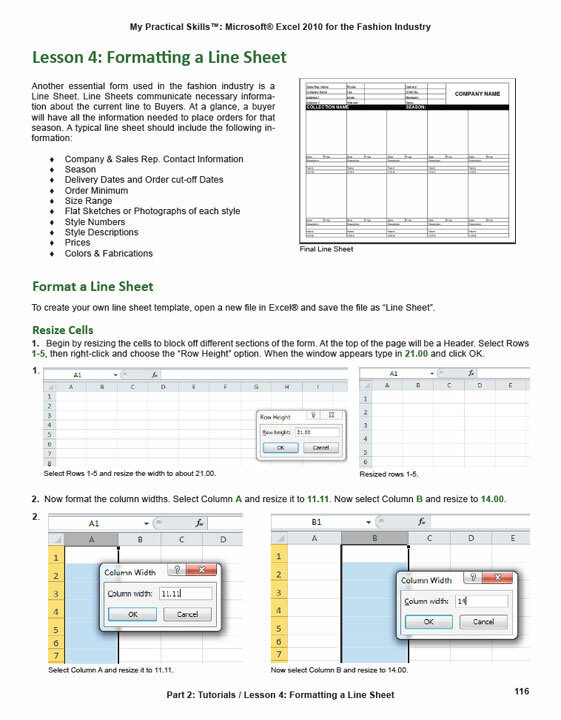 The Microsoft Excel ebook only contains sample spec templates for a few basic Juniors garments. Our Apparel Tech Pack Templates have a larger collection of sample tech packs for a variety of garment styles for Men, Women, and coming soon, Children and Plus Size. Tech Packs for Jackets and Dresses are included in this product, but specific templates for Outerwear and Eveningwear are not included. Complex details are usualy shown as callouts on a garment sketch, not on the spec sheet. The second lesson shows how to create a detail sheet which offers a large space for a detailed sketch to be placed. 3. If you do not currently know how to use Excel to create spec sheets, tech packs, enter formulas, link cells, etc., this ebook will give you a tremendous advantage at work since you’ll have the skills to create any type of spreadsheet you may need. 4. This ebook does not teach how to conduct fittings- this ebook shows how to use Microsoft Excel to create your own spec sheets, tech packs, line sheets, and costing sheets- giving you the skills needed to use Excel to create these and any other type of custom spreadsheet you may need for the fashion industry. Our How to Spec a Garment ebook teaches how to measure garments and record them in a tech pack to send to factories and patternmakers, however, it does not cover how to conduct fittings and give pattern and fit corrections. We recommend the book Ready-to-Wear Apparel Analysis by Patty Brown and Janett Rice (available at Amazon.com) for instruction on generating fit corrections. well, as a apparels manufecturer i think Your xl and ebook is very important. This book really seems like something I’ve been looking for. 1) Does it include how to communicate alterations/changes on the Grading sheet (using formulas) , after Model fitting, to the manufacturer’s? Like– how to tighten so much from here & loose from there,etc? 2) Does it include Specs templates of different style of garments & details? Can it be used for any style of garment like : outerwear, eveningwear, or for describing complex details in finishing,etc.? 3) Will it help at my work place as an added advantage? 4) Do you also have a book explaining the actual fitting process & it’s alterations, especially of draped / designer gowns. I have difficulty in expressing those complex details.